The Bergedorf Mill was built in 1831 as a tannery mill by the tanner Heinrich Martin Biel. The milled oak bark was transported by boat down the Bille River to the tannery. This explains the mill’s location, which is not ideal in terms of wind exposure. 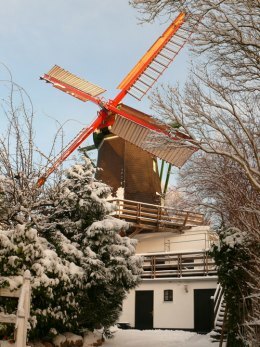 In 1880, it was converted into a grain windmill with three milling stages. In subsequent decades, the mill was repeatedly adapted to new technological innovations. Thus, along with wind power, it has a diesel motor installed in 1926 and an electric motor from 1943. All three power sources can be utilized simultaneously. This special feature, which was not altered after it was taken out of operation, makes the mill a unique technological monument. The Bergedorf Mill was placed under monument protection in 1942. The mill was in operation until 1967. The Hamburg Monument Foundation acquired the Bergedorf Mill in 2003, and placed it at the disposal of the Bergedorf Mill Association (Verein Bergedorfer Mühle e. V.), which has taken care of the mill since 1995. The Association has extensively restored the mill, provided it with new vanes, and is preserving it as a living technological architectural monument.